There is no denying that the interior design industry has changed dramatically over the last decade. The next decade will impact the industry even more dramatically. Yes, that is a bold statement, but read on. Here are my 10 predictions about the future of interior design and how it will impact your income. 1. Few solo interior designers succeed by working alone, and they must evolve and grow (i.e., add employees or outsourcers) to survive and thrive. The shocking truth we discovered when we used to conduct our Annual Interior Design Fee & Salary Survey (we don’t do this survey now) was that the median income for interior designers was $40,000. As long as solo designers attempt to do it all to save money or maintain control, they will limit their income and their passion will wane. 2. 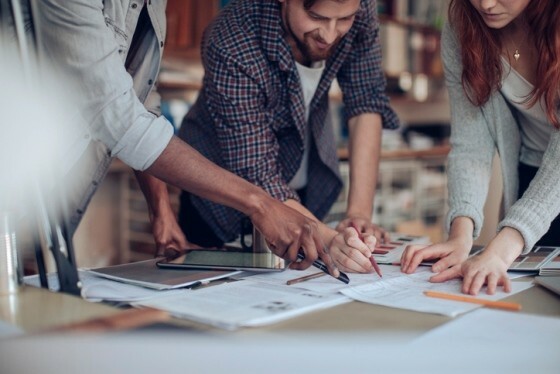 As Baby Boomers retire and settle into their “last, best home,” future design clients primarily will be Millennials, who were born between 1980 and 2000. The Millennials will be challenging for designers that prefer more control because Millennials want to collaborate. They also want speed. Rapid customization of furnishings is expected, and rapid response time will be demanded by text or you’ll have unhappy clients. Didn’t you know that phones are only for text, mobile payments, boarding passes, and for keeping up with social media? Phone calls are rarely preferred by Millennials. 3. Your business model will need to change for Millennials that prefer to shop online. Your fees will need to compensate you for your intellectual property (design and project management skills) without product purchases. I have been preaching Value Based Fees for years, and when done properly, you can earn more money and experience less stress and headaches. 4. Social media is here to stay. However, most designers post sporadically and without a true social media strategy and communication plan. Pictures posted on Instagram, Pinterest and SnapChat can and will drive future leads for your business. You need to “art direct” your shots so they are consistent with your brand. Be sure to read my Design Bloggers Conference Post for actionable recommendations. 5. EDesign may work for larger enterprises that can outsource design work to individuals who don’t want to build their own business or to overseas designers (such as China or India). Don’t be deceived that eDesign is easier and better for you. Getting enough clients means that you need to build a huge list, market with precision and have a lot of venture capital to fund the building of the business. EDesign is a business model that rarely generates a great income for small businesses. Your list, and more importantly, your relationship with your list is a valuable asset. 6. If you’re not building a list for your business, you’re missing the boat. You need to be able to communicate with your clients, past clients and prospects. Building a list is a topic that requires much more explanation, so let me know in the comments below if you’d like to know more. 8. Manufacturers are struggling to maintain the traditional sales channels. Design brands can elevate manufacturers’ visibility with their social media reach. Designers are actually becoming more and more important to manufacturers who used to sell just through brick and mortar retail establishments. High Point Market and Las Vegas Market are on a mission to attract more designers because they see the future and know you’re an important part of it. 9. To-the-trade design centers will continue to struggle. And more manufacturers will consolidate or sell to foreign investors to infuse capital into their operations so they can establish their own retail showrooms in major markets. With today’s “I Want It Now” mentality, quick ship programs with some customization will be the way of the future. And, the lead times will need to be shorter and shorter. 10. You can monetize your blog. You need to think of yourself as a visual storyteller. Stories sell. Again, be sure to read my Design Bloggers Conference Post for actionable recommendations on monetizing your blog. Let me know your thoughts about these predictions. Just post your comments below. If your business generated at least $250K of revenue (sales and products) during the last 12 months, and you’d like to know more about how we transform businesses with our “Secret Sauce” profit and cash flow strategies, sign up for a “Quick Fit” call with a member of our team. Great tips Gail! Thank you. Working on our brand and expanding my business is my top priorities for 2018. Dead on the money I would say Gail! Unfortunately times are changing but as long as we change and adjust with them we will be fine! Hi Gail, I would like to know more about building a list. Your predictions are bang on. I am already dealing with Millennials. They are not as frenetic or demanding as I had imagined. They do love purchasing on line and googling furniture websites, tirelessly. I actually welcome that. It reduces the pressure and running around – whatsapping is the key form of communicating and I charge for design only and project managing, if at all. Easy. Love it! I would like to know know more about building a list. Thanks! Your insight is so spot-on. My current dilemma is do I maintain the expense of a design studio or just chuck it and work from home, selling less product and focusing more on consultation services… I have been in the industry for 30 years and my challenge is giving up that “control” over a project that has come with heavy internet presence and use. Also sad to see how high quality is not valued as much. I am struggling with change and kudos to Lisa and Deborah above for their positive outlook!! Great article and you are right on the money regarding millenials- I’ve had the exact experiences you describe. But you only mention Millenials and Boomers. What about the middle- Gen X and Y? These are the current 35-55’s and have income to spend. And they are a pleasure to work with. I am interested in learning more about building a list. Thank you! #2 was Spot on! I love that Milenials know what they want, but the texting threads that go on and on can get difficult to follow. Let Ali e exhausting. I had one that a conversation lasted for 3 months. I was ready to give up thinking I would never meet her or talk on phone with her and she was just shopping around. She finally had me do some great projects and there is no end in sight. They are also a very trusting bunch! Awesome post. My sons are Millenials. Spead and ease of process are mist important to them. If not delivered they move on to the next who offers it. Very unemotional business dealings. . Sorry, meant to write “speed”! Great article! I would love me to know more about creating a list. Thank you. I would like to learn more about building a list. If you grow a list, you have the potential of communicating until someone is ready to do business with you. It can be as simple as using a free software product like Mail Chimp. You can offer a document for free (that is of value to your readers) and then they “opt-in” for your list. Then you can begin a newsletter. Whatever you do, make sure the newsletter is sent out at least monthly. Great message and article! I would love to know more about creating a list and the Secret Sauce you mentioned. So sign me up for a “Quick Fit” – profit and cash flow strategies! I look forward to speaking with a member of you staff soon!! See you all at the Design Summit in October! Very Excited!! Great article …, I would like to learn more about building a list. Fabulous! I would like to know more about building a list and more about Value Based Fees. YES! We must evolve! Thank you Gail! We should add the celebrity factor. Designers with a celebrity factor and following will stand to branch out more in income. Being a Designerlebrity brings benefits of the likes of athletes such as sponsorship, licenses, endorsements deals, etc. Thank you Gail. I too would like to know more about how to keep in touch with past clients on a regular basis. Gail-this is a stunning amount of information in a time capsule-otherwise known as a blog! I will look up your other blogs as your reference! Thank you for sharing the shifts in our industry and steps to be successful.